Eli Grba was born on Thursday, August 9, 1934, in Chicago, Illinois. 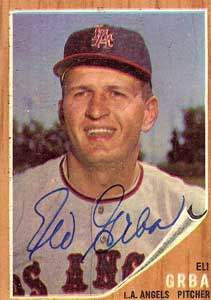 Grba was 24 years old when he broke into the big leagues on July 10, 1959, with the New York Yankees. His biographical data, year-by-year hitting stats, fielding stats, pitching stats (where applicable), career totals, uniform numbers, salary data and miscellaneous items-of-interest are presented by Baseball Almanac on this comprehensive Eli Grba baseball stats page. On April 11, 1961 , the Los Angeles Angels played their first regular season game in franchise history, defeating the Baltimore Orioles 7-2 in Memorial Stadium. Around the horn that day were Eli Grba (P), Del Rice (C), Ted Kluszewski (1B), Ken Aspromonte (2B), Eddie Yost (3B), Fritz Brickell (SS), Bob Cerv (LF), Ken Hunt (CF) and Albie Pearson (RF).